New research has revealed abrupt warming, that closely resembles the rapid man-made warming occurring today, has repeatedly played a key role in mass extinction events of large animals, the megafauna, in Earth's past. 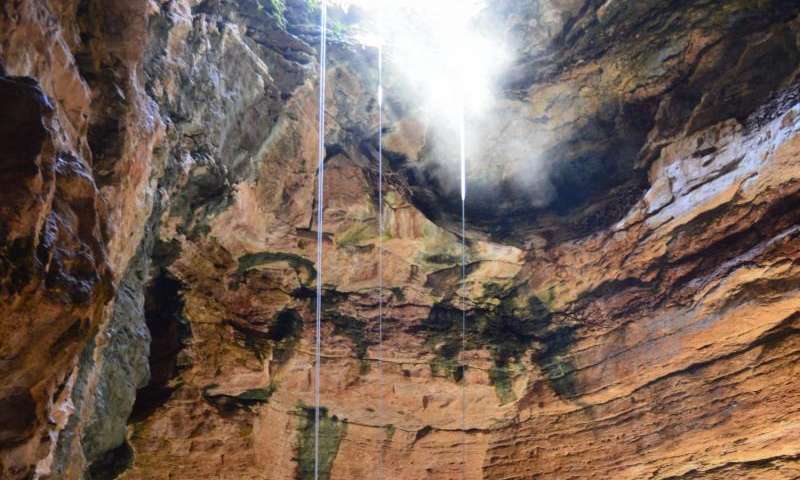 "This abrupt warming had a profound impact on climate that caused marked shifts in global rainfall and vegetation patterns," said University of Adelaide lead author and Director of the Australian Centre for Ancient DNA, Professor Alan Cooper. "Even without the presence of humans we saw mass extinctions. When you add the modern addition of human pressures and fragmenting of the environment to the rapid changes brought by global warming, it raises serious concerns about the future of our environment." "It is important to recognize that man still played an important role in the disappearance of the major mega fauna species," said fellow author Professor Chris Turney from the University of New South Wales. "The abrupt warming of the climate caused massive changes to the environment that set the extinction events in motion, but the rise of humans applied the coup de grace to a population that was already under stress." I'm thinking that if a species can't handle a .4c increase in temperature, they may not have evolved to be very robust re: ability to adapt and that extinction is already a foregone conclusion. Bye, bye, nothing personal...signed, Mother Nature. Only an idiot can look at that graph and claim "warming has stopped"
Are you sure? Check out the mean temperature after the year 2000. "The combined average temperature over global land and ocean surfaces for June 2015 was the highest for June in the 136-year period of record, at 0.88°C (1.58°F) above the 20th century average of 15.5°C (59.9°F), surpassing the previous record set just one year ago by 0.12°C (0.22°F). This was also the fourth highest monthly departure from average for any month on record. The two highest monthly departures from average occurred earlier this year in February and March, both at 0.90°C (1.62°F) above the 20th century average for their respective months, while January 2007 had the third highest, at 0.89°C (1.60°F) above its monthly average." "June 2015 also marks the fourth month this year that has broken its monthly temperature record, along with February, March, and May. The other months of 2015 were not far behind: January was second warmest for its respective month and April was third warmest. These six warm months combined with the previous six months (four of which were also record warm) to make the period July 2014–June 2015 the warmest 12-month period in the 136-year period of record, surpassing the previous record set just last month (June 2014–May 2015)." Tell us again "warming has stopped". The study of this recent mammoth extinction appears to be mired in politics, because the Firestone data offers an enormously persuasive argument that the half-million mammoths -- as well as the numerous other animals, on multiple continents -- disappeared as a result of some sort of cosmic event. We know this because there are by now 7 instances of mammoth tusks that are peppered with meteorite fragments which experiments revealed had to be traveling at 1,000 mph. Furthermore, there is a black radioactive mat with exotic isotopes at numerous sites across North America, and in one particular instance, it is very obviously draped over a mammoth carcass. The hijacking of every single scientific discipline by warming theories was made possible by the uniformitarian assumption. This will be a complete takeover before it is finished. It's time to reconsider the uniformitarian assumption, people. "Phaethon, the son of Helios, having yoked the steeds in his father's chariot, because he was not able to drive them in the path of his father, burned up all that was upon the earth, and was himself destroyed by a thunderbolt. Now, this has the form of a myth, but really signifies a declination of the bodies moving around the earth and in the heavens, and a great conflagration of things upon the earth recurring at long intervals of time." "All of these stories, and ten thousand others which are still more wonderful, have a common origin; many of them have been lost in the lapse of ages, or exist only as fragments; but the origin of them is what no one has told." The new and improved GloBULL warming, now with 50% more BULL. "The most interesting new results were presented by Jacquelyn Gill, a graduate student in the Department of Geography at the University of Wisconsin–Madison. She has been studying lake sediments that contain spores of sporomiella (a fungus that occurs in herbivore dung) in the time range around the YD. This fungus is related to the total mass of herbivores and can be used as a proxy for the megafauna population. Her data show a gradual decline, beginning well before the YD marker and extending beyond the end of the Younger Dryas cool period. Indeed, in some isolated locations mammoths and mastodons did not go extinct until much later: there were dwarf wooly mammoths on Wrangle Island in Alaska until about four thousand years ago. Some large North American mammals did not go extinct at all, including the bison, the moose, and the grizzly bear"
Firestone does not make an "enormously persuasive argument" for mammoths extinction by a cosmic event.
" In The Cycle of Cosmic Catastrophes, Firestone links the YD impact to this postulated nearby supernova, which he asserted took place 41,000 years ago and initially devastated most life in Asia. Then 34,000 years ago the shock wave from this supernova initiated another wave of intense cosmic bombardment of Earth. 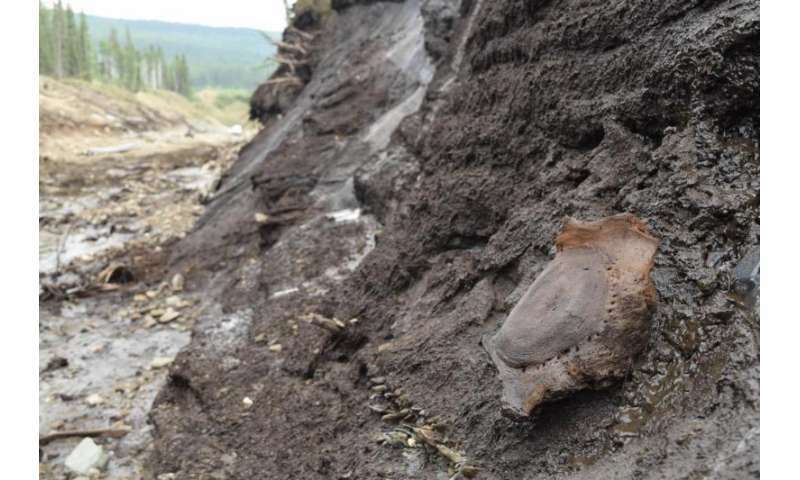 The only evidence for this event is the remarkable claim that mastodon tusks from about that time are pitted with cosmic dust, suggesting that these animals received the direct blast of supernova material striking Earth (unstopped, apparently, by our atmosphere)." The link I provided above is an entertaining take down of Firestone's faulty hypothesis. You guys need to go to a freaking museum. They can look at global ice extent and say it's "increasing" as well. The mind boggles but welcome to the human race. "The mechanisms of Late Pleistocene megafauna extinctions remain fiercely contested, with human impact or climate change cited as principal drivers. Here, we compare ancient DNA and radiocarbon data from 31 detailed time series of regional megafaunal extinctions/replacements over the past 56,000 years with standard and new combined records of Northern Hemisphere climate in the Late Pleistocene. Unexpectedly, rapid climate changes associated with interstadial warming events are strongly associated with the regional replacement/extinction of major genetic clades or species of megafauna. The presence of many cryptic biotic transitions prior to the Pleistocene/Holocene boundary revealed by ancient DNA confirms the importance of climate change in megafaunal population extinctions and suggests that metapopulation structures necessary to survive such repeated and rapid climatic shifts were susceptible to human impacts." When did it become a tabloid? When it disagreed with philstacy9's religious and/or political beliefs. But IMO the event which killed the mammoths was really fast - and it wasn't warming. Most of animals which were found at Siberia look like being frozen alive, often with the fresh summer food in their stomach. No scavengers ever touched them. ...says the idiot posting to a story with a picture of a disarticulated mammoth vertebra. The subject of the study is not man-made global warming. But apparently a defense of warming needs to be introduced nevertheless. Earth will be entering its 22nd year without statistically significant warming trend, according to satellite-derived temperature data. Since September 1994, University of Alabama in Huntsville's satellite temperature data has shown no statistically significant global warming trend. For 21 years there's been no warming trend apparent in the satellite records and will soon be entering into year 22 with no warming trend apparent in satellite data — which examines the lowest few miles of the Earth's atmosphere. Satellite data from the Remote Sensing Systems (RSS) group also shows a prolonged "hiatus" in global warming. After November of this year, RSS data will be in its 22nd year without warming. Ironically, the so-called "hiatus" in warming started when then vice President Al Gore and environmental groups touted RSS satellite data as evidence a slight warming trend since 1979. "Newly corrected and updated global surface temperature data from NOAA's [National Centers for Environmental Information] do not support the notion of a global warming 'hiatus,'" wrote NOAA scientists in their study. The study was highly criticized for inflating the temperature record since the late 1990s to show vastly more global warming than was shown in older data. The warming "hiatus" was eliminated and the warming trend over the period was more than doubled. "There's been so much criticism of NOAA's alteration of the sea surface temperature that we are really just going to have to use the University of East Anglia data," Pat Michaels, a climate scientist with the libertarian Cato Institute, told The Daily Caller News Foundation. "I don't think that's going to stand the test of time," Michaels said of NOAA's recent adjustments. Mammoths survived from the Pliocene epoch, around five million years ago, to around 4500 years ago – so they survived until the end of the Holocene Optimum, the peak warm period of our current interglacial, which preceded our cooler modern climate. However, the Mammoths also survived the Eemian Interglacial, a much warmer period than today, which occurred between 130,000 and 115,000 years ago. The Mammoths survived the mid Pliocene, 3 million years ago, when temperatures were 2-3c higher than today, and sea levels were 25m higher. So it seems likely Mammoths would have survived the comparatively feeble warmth of our Holocene, if it weren't for humans. I hesitate to say "shortsighted", but I have to wonder about AGW fears and anthropocentrism. To us, a couple of hundred years is a lot, and we get scared if even a small percentage of that is showing something scary. To the earth, a couple of hundred years is nothing...a blip in the geologic timescale, and meaningless over the long run. We focus on this meaninglessness, and imagine we have something to do with it; to the extent that we risk moral and economic chaos in our societal policies. And why did Noah include all those insects and diseases? The Earth is made from water. If you find the answer for yourself to the question "how", you will not asking such questions. "And why did Noah include all those insects and diseases? "" Because it was the will of God in which Noah had full confidence. And because all those organisms are involved in complex bio balans on the planet Earth. And those which cause diseases are part of the curse with which God has punished the first people and their descendants, so that although Adam and Eva broke His warning not to eat the fruits from the tree of knowledge (before develop their spiritual power and moral strength) they are not repented but found excuse in each other. So using the satellite surface temperature data is a good way to lie - at least to yourself, if not to others. 1. The latest change from NOAA decreased the overall warming. It always amazes me that anti-science groups oppose changes that reduce the warming. This all seems to be because they have so much invested in the so-called hiatus. But there's plenty of data to prove that the hiatus in the heating of the earth never existed, so that seems such an iffy thing to hang your hat on. Especially if your dependent on questionable data like the satellite surface temperature record. 2. Pat Michaels is well known for misrepresenting science in an attempt to discredit science (http://www.skepti...ata.html ). If the best you've got is a quote from Michaels, you seem to be saying that your argument is a very weak one indeed. 1. The latest change from NOAA decreased the overall warming. Why would data that they put out need to be tweaked by them after it is shown to falsify their science? Why has rationale of the changes been shot so full of holes? One can argue that in the interest of intellectual honesty they amended their findings to correct an error; I am fully in support of this. But in the real world, people that need to back-track and correct work that is influencing ruinous policies - should they even retain their job - will have everything else they've ever done and ever will do questioned severely. thus, the role of the skeptic becomes invaluable, and should be respected, not denigrated. So, why can't you see it?